Dream Events by Evangela most certainly lives up to the name. A Dream Event! Working with Evangela has been a pleasure and I couldn't have thought of a better person for the job. Evangela's best quality is her level of communication. Communication was one very important factor when it came to selecting a wedding coordinator. I was located in Atlanta, GA while my husband was in Waterloo, IA and with our wedding being held in Charleston, SC we had to communicate very often. My first conversation and impression of Evangela was like a dream come true, because with her attention to detail, ideas, and experience I knew she was the right one for the job! She definitely executed and exceeded the plans and vision I had set for our wedding day. Another amazing quality for Evangela her timeliness! Like all couples they want their wedding to start on time, but most often this doesn't occur---well not with Dream Events running the show! We were right on time! Her time management skills are given 5 stars! I think that was the one thing I wanted most of all was to start our wedding on time and she made sure that was her number one priority. When she is given instructions and guidelines she will follow them to the "T". If you want to eliminate stress and worry from your special day, hire Dream Events as your planning team, because you will surely not be disappointed! Creativity at it's best, an unforgettable experience-- at the highest quality is what you will have working with this team of professionals and what a memorable moment I will cherish forever! Thank you Evangela for making our dreams come true! Do you want the wedding of your dreams? Dream Events by Evangela will provide you with a fairytale experience unlike anything you have ever seen before. Her professionalism and attention to detail caters to both the wants and needs of the bride and groom; creating a memory that will last a lifetime. For our wedding, Evangela insured that we had everything we wished for. She alleviated any stress associated with planning a wedding. Her open line of communication allowed us to relay our thoughts and ideas, bringing our fantasies to life! She was able to create an experience that was enjoyable for both our friends and family alike. We had several people comment how well everything turned out. The comment we received most was the fact that the wedding started on time. The decorations at our wedding and reception venues were exquisite! So, if you want your dreams to come true, hire Dream Events by Evangela. She will guarantee you have a magical wedding. Evangela will provide a once in a lifetime experience with timeless memories. We cannot wait to book our next event with Evangela. Our wedding was May 13, 2017 and we had the honor of having Evangela Myers of Dream Events by Evangela as our wedding coordinator and decorator. What can I say about our experience working with Evangela Myers, simply amazing! Evangela exuded professionalism from our first meeting until our wedding day and beyond. She has a wealth of knowledge and puts her expertise to work as soon as is hired. She made sure our day went smoothly and that every detail was perfect. Our wedding day went perfectly despite the weather because Evangela had a Plan B for every possible situation. Thank you for your hard work and dedication in ensuring that we had the Day of Our Dreams! "It was an absolute pleasure to have Dream Events by Evangela as our wedding coordinator. After our first meeting with her, we knew we picked the right person and team. Evangela and the Dream Events staff are professional, organized, creative, punctual, friendly and they made our planning process and wedding day stress free. The Dream Events team made our wedding day more beautiful than expected. Mark and I cannot not say thank you enough!! Our wedding day was perfect!!! T hanks Evangela and Dream Events!!." "Thanks so much to Dream Events by Evangela for planning our 50th Wedding Anniversary Party. It was just perfect in every way, from the table decorations to the food and the friendly atmosphere that Evangela and her staff created. 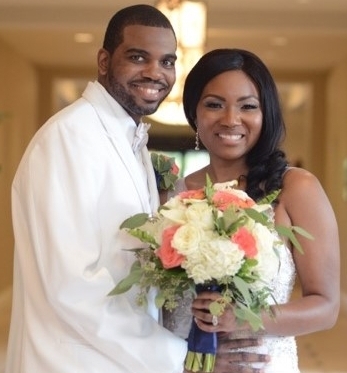 Lloyd and I are truly thankful to Dream Events for making this such a special memory." Oh my God! Where do I start? Dream Events and her staff are simply amazing. Our wedding day was perfect. I was in awe just like everyone else. It was like one of the celebrity wedding that I had admired on TV. You did such an awesome job! People are still talking about it. Thanks for making our day unforgettable!! Dream Events by Evangela did a wonderful job of decorating for my wedding on May 30,2016. She was professional, punctual, and very helpful in my decision making process. She was also very knowledgeable to the wedding process. I've never been married so every question I had, she had an answer for it. She kept me simple and elegant and she delivered; especially my reception area. It was perfect and I was very pleased with the outcome. Simply Perfect!